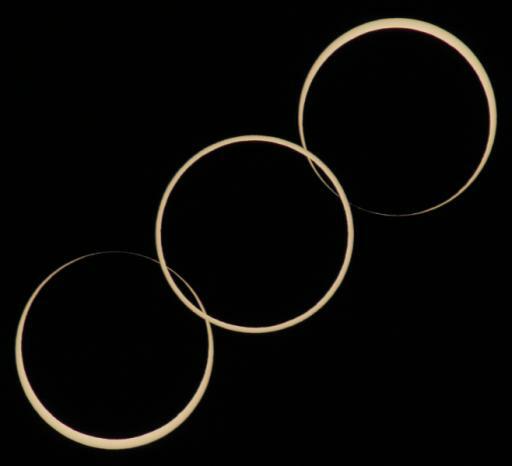 We were a small group of 4 Danes who travelled to Madrid to see the annular solar eclipse. 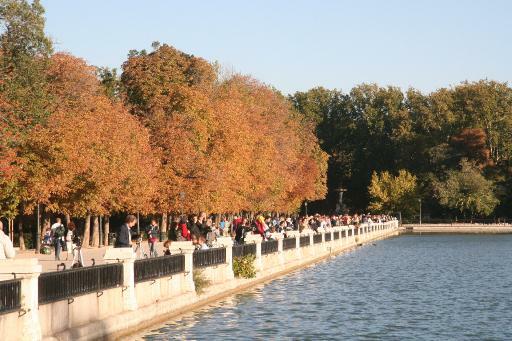 After having checked a number of possible observation sites we finally chose the western side of the large lake in the Retiro Park as our observation site. Several hundred other eclipse observers had made the same choice but there was place for everybody. We saw the event on a perfect blue sky. I wish we've had that weather in South Africa! 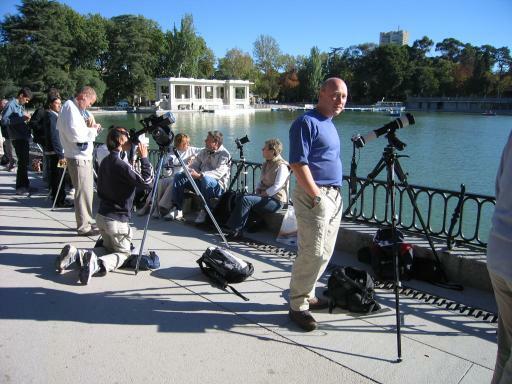 The observation site in the Retiro Park. Our observation site about one minute after second contact. I had put Danish flags on my telescope - a birding scope with Baader solar filter. Many people passing by asked: "You're from Norway?" 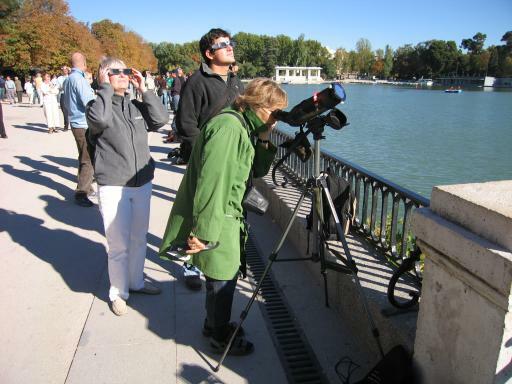 Other eclipse watchers in the Retiro Park. All sorts of equipment was lined up along the lake side. The rising Sun at two-minute intervals from 10:48 (lower left) to 11:08 (upper right). Exposure: f/11, 1/1000 sec, 400 ASA, Baader solar filter. 10:56: 2nd contact, 10:58: mid-eclipse, 11:00: 3rd contact. Due to the rotation of the Earth, the Sun seems to move about 30' (arc minutes) across the sky every two minutes. The angular diameter of the Sun is a little larger - about 32' - that's why the images are overlapping. 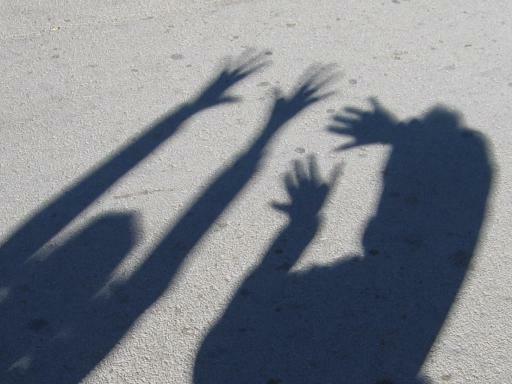 Playing with shadows during the partial phase: shadows from vertical fingers are unsharp, shadows from horizontal fingers are sharp. 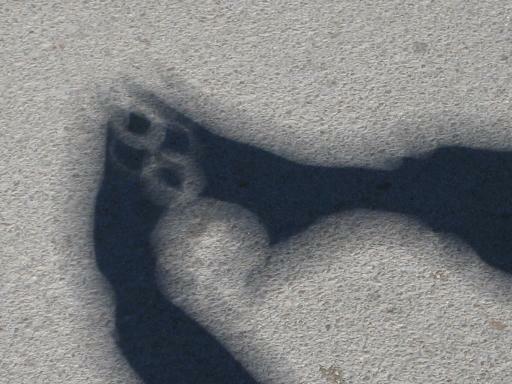 Playing with shadows at mid-eclipse: images of the ring-formed Sun through holes between fingers. Also note that the boundaries between the full shadow and the partial shadow and between the partial shadow and the unshaded areas are sharp. While definitely not as spectacular as a total eclipse, it was an exciting and fascinating experience - well worth the trip to Spain. 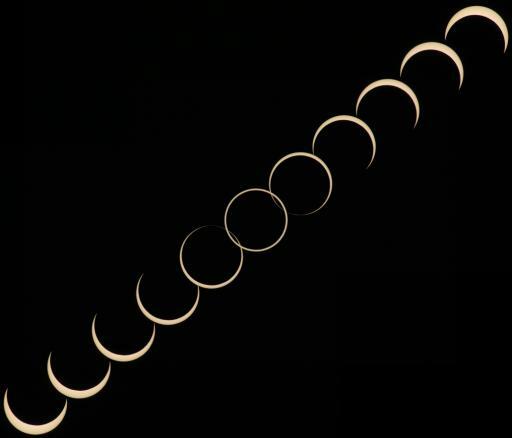 Annular Solar Eclipse of 2005 October 03 by Fred Espenak. Reports of the Annular Solar Eclipse 2005.